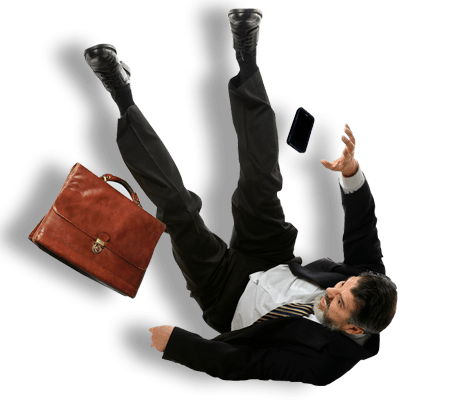 A “slip and fall” or “trip and fall” is the generic term for an injury which occurs when someone slips, trips or falls as a result of a dangerous or hazardous condition on someone else’s property. It includes falls as a result of water, ice or snow, as well as abrupt changes in flooring, poor lighting, or a hidden hazard, such as a gap or hard to see hole in the ground. The National Center for Injury Prevention and Control estimates that in 2004, more than 8 million people were injured in falls. 20-30% of people who fall suffer moderate to severe injuries such as bruises, hip, or head traumas. These injuries can make it hard to get around and limit independent living. They also can increase the risk of early death. The most common fractures are of the spine, hip, forearm, leg, ankle, pelvis, upper arm, and hand. Many people, who fall, even those who are not injured, develop a fear of falling. This fear may cause them to limit their activities, leading to reduced mobility and physical fitness, and increasing their actual risk of falling. In 2000, direct medical costs totaled $0.2 billion ($179 million) for fatal falls and $19 billion for nonfatal fall injuries (Stevens et al. 2006). Fall related injuries are of large concern, mostly to older individuals. According to the Center for Disease Control, in 2005, 15,800 people age 65 and older died from fall-related injuries, 1.8 million people age 65 and older were treated in emergency rooms for fall-related injuries, and over 433,000 of these people were hospitalized. If you are on someone else’s property and injure yourself as a result of a dangerous condition on the property, the landowner or business proprietor may be liable for your injuries. If you are a property owner and someone injures himself on your land, you may find yourself legally responsible for his or her injuries. Either way, you should seek the advice of an experienced personal injury attorney.